There are many beautiful hairstyles that you would want for your wedding ceremonies, this one is popular amongst brides seeking a more casual look. Following is a tutorial for a hairstyle suitable for a reception, post wedding party or sangeet, where the mood is more festive and you do not have to worry much about letting your hair loose. 1. Part hair on it’s natural side. 2. Take a handful of hair and divide it into 3 parts. 3. French braid till a finger’s length. This braid will prevent your hair falling over your face. 4. Then, leave the hair as it is top segment will remain firm because of the braid and the down segment will fall loosely over your shoulders. 5. Take a new segment of hair from the back of the dropped top piece. 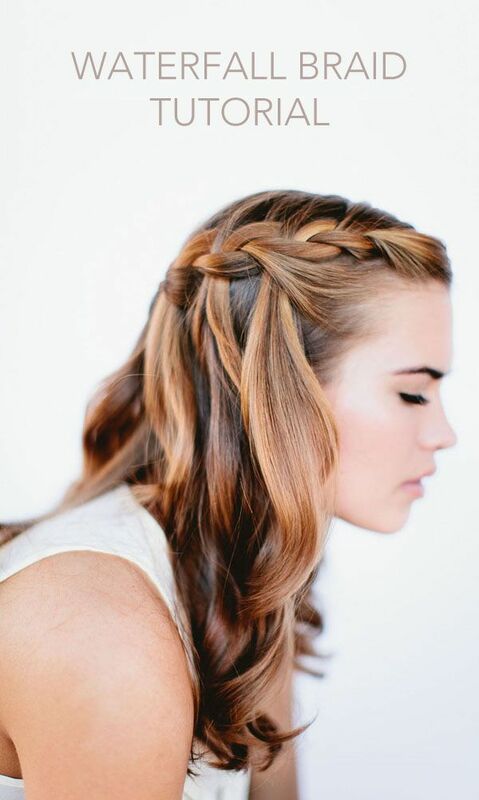 Start with a French braid with this new segment of hair. 6. Keep moving across the crown. DO NOT FORGET, each time you take a segment of hair from the top of your head to add to the braid, let it drop and replace it with a new segment. 7. On reaching the other side of the head, clip the end of the braid with Bobbi pins. *I know it looks and sounds way too complicated, but if you give it a try and practice for a few times, you will definitely get a hang of it. Comb your hair, remove all the tangles and knots. Let it fall loose before you start. Freshly shampooed and conditioned hair can get too slippery.